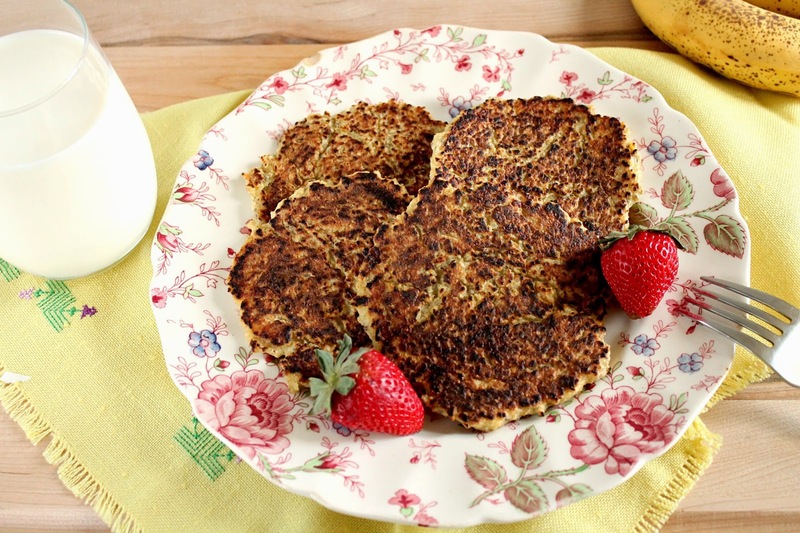 Today I am sharing with you a gluten-free recipe for pancakes that uses Catelli Gluten Free Pasta. This recipe is courtesy of Kathy Smart, one of North America's leading gluten-free experts. In our home, we don't have any issues with food containing gluten so the idea of a gluten-free pancake was intriguing. This pancake is actually made with cooked pasta! The ingredients in this pancakes are things I always have around. I love recipes that don't require me to go out and buy more ingredients. Although this recipe uses medium eggs and I had XL eggs. So after some googling I found that 1 medium egg = 3 tbsp and 1 XL egg = 4 tbsp. So I beat 2 XL eggs and measured out 6 tbsp to make these pancakes. From this recipe I got 7 pancakes using a quarter cup measure. I don't have a blender so I used my food processor to make these. The batter was thick so I needed to spread it out on the frying pan. The texture is very different from a regular pancake. There is no sugar in the recipe, so I highly recommend having them with real maple syrup. I liked the crunch the chia seeds gave. The texture of the pancake is very different from a regular pancake but once topped with maple syrup they reminded me more of pancakes. If you follow a gluten-free diet, this would be a good recipe to try. You can find the recipe for these pancakes at the end of this post. May is Celiac Awareness Month and in celebration Catelli is having a Gluten Free Pastabilities Challenge. 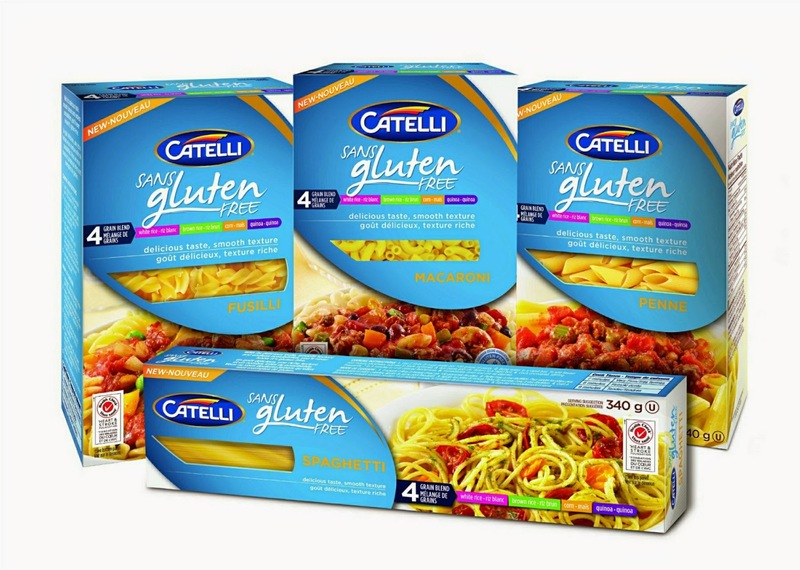 Catelli Gluten-Free Pasta is a 2015 Best New Product Award winner, as voted by consumers. To enter the Gluten Free Pastabilities Challenge, create and post your own original gluten free pasta recipe on Catelli's Facebook page between May 4-31, 2015. The three people who have their recipe selected and receive the highest number of likes on Catelli's Facebook page will receive a year's supply of gluten free pasta from Catelli. You can get a coupon for Catelli's Gluten Free Pasta HERE to help you get started on creating your own original gluten free pasta recipe. Below you will find some great tips on cooking with gluten free pasta from Kathy. 1. For a unique and delicious gluten free dessert, cook gluten free pasta in water with a bit of honey and a pinch of salt, then drain the pasta, combine it with ricotta cheese and meltable chocolate chips, and bake the mixture for 15-20 minutes at 350°F. Top with fresh strawberries or other fruit, and enjoy! 2. Use gluten free pasta to give a ‘creamy’ texture to your soups without adding cream or butter. Add ½ cup of pasta to your existing pureed vegetable soup recipe. Purée the vegetables together with the cooked pasta to add a unique, velvety texture that will appeal to vegan, gluten free or dairy-free eaters. 3. Avoid the need for flour by using cooked, puréed gluten free pasta to make gravy or white sauce. Adding a bit of chicken stock and a dash of gluten free tamari sauce will make a sauce that’s perfect for topping chicken and pasta dishes, or for use in casseroles. 4. Use leftover gluten free pasta to make mini casseroles in muffin tins for a portable gluten free snack. Combine leftover pasta (I like using spaghetti to make little nests) with pasta sauce, chopped green olives, mushrooms and onions. To help bind the pasta nests, add 1 beaten egg for every 3 cups of pasta. Add to muffin tin, top with fresh Parmesan or mozzarella cheese, and bake at 350°F for about 10 minutes. 5. Instead of bacon and eggs, try pasta for breakfast. Cook up your favourite gluten free pasta and add a bit of pesto or your favourite pasta seasonings. Fry an egg, sunny-side up, and serve it on top of your pasta creation. Add some fresh chopped vegetables to add colour and a boost of nutrients. 6. Try pasta salad in a jar! It’s a fun way to make – and store – a pasta meal in advance. Start with salad dressing of your choice at the bottom of the jar and then begin layering your favourite pasta salad ingredients, starting with hard veggies, such as carrots, cucumbers or peppers. Next, add any cheese or beans (I like to add goat cheese, black beans and cooked quinoa) along with cooked gluten free pasta. Add any greens, such as spinach or lettuce, next and crown the final layer with such toppings as fruit, avocado, nuts or seeds. Screw on the jar lid and SHAKE, SHAKE, SHAKE before pouring into a serving bowl. 7. For a vegan or dairy-free version of your favourite gluten free muffin, cake, bread or cookie recipe, try substituting 2 eggs with ¼ cup of cooked pasta, puréed with 1 tbsp of water and 1 tbsp of Chia seeds. 8. Turn cooked pasta into gluten free pizza by creating a cauliflower pizza crust using cooked, grated cauliflower, mozzarella cheese and ¼ cup of puréed cooked gluten free pasta to help bind the dough ingredients. Add your favourite gluten free toppings to the recipe and cover with gluten free cheese. Bake the pizza crust with parchment paper for easy removal from the oven. 9. Add gluten free pasta to smoothies for a fun way to include pasta at breakfast or snack time. Add ¼ cup of cooked gluten free pasta to any of your smoothie recipes, or try combining 1 cup of milk, ½ cup of frozen berries and 1 scoop of your favourite protein powder along with the cooked pasta. Adding pasta will increase your smoothie’s fibre content and create a thicker consistency, much like a milkshake. 10. Add puréed pasta to hummus! Yes, hummus! The structure of the cooked pasta adds a creamy consistency to hummus. Puréed pasta works well in bean dips as well. 1. Add all of the above ingredients (except the coconut oil) in a blender and blend. 3. Cook for an additional 2 minutes. 4. Serve with fresh bananas and pure Canadian maple syrup on top. Per serving (1 pancake): 165.24 calories, 5.08 g fat, 1.16 g saturated fat, 0 g trans fat, 105.75 mg cholesterol, 36.58 mg sodium, 181.43 mg potassium, 25.59 g carbohydrates, 4.13 g fibre, 4.15 g sugars, 6.35 g protein. Disclosure: I received samples for this post. All opinions are my own. Dude this is crazy! I would have never have thought to have used pasta in pancakes!